Pharmaceutical giant GlaxoSmithKline (GSK) has partnered with Apple on a new clinical study on rheumatoid arthritis. The study relies on an iPhone app to collect data about arthritic symptoms from users as they go about their daily lives. That sounds great at first glance, but how well will it protect your privacy? So far there are just a handful of ResearchKit apps tied to clinical studies, but the GSK partnership is the first time Apple has joined forces with a major drug company. 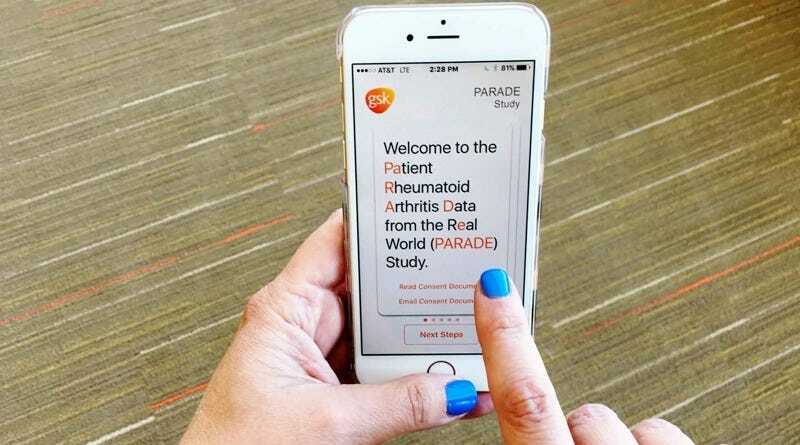 The Patient Rheumatoid Arthritis Data from the Real World (PARADE) study will use its app to track the mobility of over 300 participants suffering from rheumatoid arthritis, including information on their level of joint pain, fatigue, and changing moods. No drugs are being tested. Rather, the app guides users through a simple wrist exercise, with the iPhone’s built-in sensors recording data from that motion. That data may help Glaxo design better clinical trials in the future. There are plenty of potential benefits to using the ResearchKit platform. It’s a huge boon to recruiting viable participants for medical studies—which can take months or years, depending on the study—and it’s cost effective, potentially saving millions of dollars. “Certainly you’ve also taken out the site costs, and the costs of having nurses and physicians explaining the studies to them and recording information,” Rob DiCicco, head of Glaxo’s clinical innovation and digital platforms group, told Bloomberg News. But from the start, ResearchKit raised a host of ethical questions, particularly about protecting consumer privacy, and getting informed consent from all study participants. Apple insists it never sees the data you provide through ResearchKit. But who the research institutions, hospitals, and doctors share that data with is up to them (within the constraints of laws like HIPAA.) And collected data is typically “anonymized” by companies like Sage Bionetwork, removing any possible identifiable information before sending the data to the institution conducting the study. The first few ResearchKit apps seemed to improve on the usual one-on-one process for informed consent. With an asthma app designed by Mount Sinai Hospital, for instance, users must flick through 12 separate pages, each with big graphics, large 18-point font print, and simple words describing every possible risk and benefit of the study. Then users take a quiz to demonstrate they at least have a rudimentary understanding of just what they’re agreeing to. So how does the GSK PARADE app-based study address those concerns? We asked bioethicist Nicholas Evans of the University of Massachusetts Lowell to weigh in, based on his own cursory exploration of the app. The biggest issue, according to Evans, is the app’s approach to informed consent. Tapping the button to launch the consent process takes the user to a nine-page PDF document in 12-point font—the kind of thing that’s really difficult to read on your iPhone. Then the user taps the “Agree” button in the bottom right hand corner. Voila! Instant informed consent. It’s similar to those End User License Agreements that everybody agrees to without even reading them, because come on, we just want to use the damn app already. UPDATE 7/21 6:45 PM: According to Mary Ann Rhyme, director of external communications for GSK in the U.S., the PARADE app does walk the user through several explanatory screens before prompting them with the PDF consent document. Users also have the option of emailing that document to themselves if they’re having trouble reading it on the iPhone screen, and of contacting an independent support center if they have questions. Whether this is sufficient to overcome the cultural conditioning of users to just click “agree” will likely remain a point of contention for bioethicists. According to Evans, the app didn’t work with the usual university-based IRBs, but with a Seattle-based, private, for-profit IRB called Quorum Review. Correction, 7/26/16, 5:00 PM ET: Corrects earlier version of this article to state that the GSK app, and not the Apple ResearchKit platform, worked with a private IRB. Update, 7/26/16, 5:00 PM ET: This article has been updated to clarify the role of a private IRB in the development of the GSK app.